Rumors floated about the skill of director Dan Trachtenberg and blockbuster producer J.J. Abrams. Reports of a “good cast” were the final lure. Sitting through a string of imbecilic horror previews leading up to the feature, it was impossible not to be ashamed and angry that Hollywood’s summer menu for the PG-13 population is so thoroughly rooted in guns, explosions, treachery, betrayal, and violence of every imaginable kind. These are the blockbusters that spread throughout the rest of the world as well as serving as the summer menu for Americans. Why only this? Where are the clever mysteries, detective stories, spy yarns and stories of triumph over adversity? 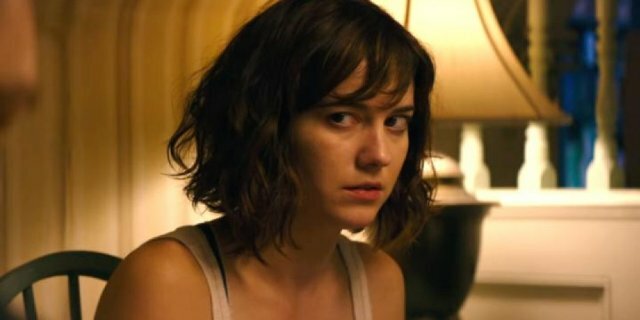 Hollywood has learned that they can lure audiences by lumping previews of a similar stripe to the feature about to be shown – the irresistibly tasty bait of “if you like this one, you’ll like these.” As the last horrific trailer unspooled, I began to suspect the worst about 10 Cloverfield Lane. John Goodman is very clever as Howard, the nutcase who has spent years preparing his impenetrable survival house for the apocalypse. Mary Elizabeth Winstead is impressive as Michelle, one of Howard’s two prisoners and John Gallagher Jr. creates a credible Emmett as the second captive. The movie unfolds as an ugly chess game with Howard claiming he is saving his prisoners’ lives by keeping them in the locked dungeon he calls his safe place. During the bulk of the film, the three of them play games to pass the time while Michelle plots her escape. What will she find when she gets out? Will it be the attack Howard described? Or something else entirely? The admirable cast gives us a grand puzzle until the whole thing leaps into blockbuster chaos. It becomes what is known as a “sliver” movie – an ordinary movie with a taste of big time chaos – horror on the cheap. The story turns from a thriller/suspense puzzle into an ear-splitting soundtrack for what morphs into a movie full of terror, violence, and shock. When the ordeal is over it is impossible not to reminisce about stories of yore when scripts jumped alive with verbal surprises and stories allowed you to sit in thoughtful silence wondering, “who did it?” For the real deal, you might consider returning to Bridge of Spies. Disclaimer – it’s exactly what I don’t like – hitting the audience with high tech terror. If that’s what you like, then toss this review and go see it. If fear is your pleasure, then 10 Cloverfield Lane is a banquet. This review was posted on March 23, 2016, in Drama, Horror, Mystery/Suspense. Bookmark the permalink.